Leicester City: The Greatest Sports Story. Ever. As the clock hit the 96th minute of the Tottenham – Chelsea match, the entire soccer world realized that the greatest underdog story in sport history had concluded. After trailing 2-0 at halftime, Chelsea came back to draw with the second place Tottenham Hotspur, thanks to a brilliant 80th minute equalizer by Chelsea’s Eden Hazard. As the final whistle blew to end the heated London Derby, Tottenham’s title hopes were dashed and for the second year in a row, a new Premier League champion was decided at Stamford Bridge. However, this time it wasn’t one of England’s heavyweight contenders, but instead a club that had been written off before the season even started. Located right in the heart of England, world-famous clubs, always surrounded Leicester with Manchester just to the North and London to the South, but until this year, very few that did not follow the BPL closely even knew a soccer club existed there, even though the team was founded in 1884 (132 years ago). The Leicester City Foxes were simply insignificant, finishing at the bottom of the table the year before and had only received promotion into England’s top league the year before that. They entered the season 5000-1 odds to win the title this year and featured a team that had cost just £80 million to put together (to put in perspective Manchester City spent £80 million on one transfer alone earlier in the year). Billy Beane’s Moneyball scheme wouldn’t stand a chance against this. Other recent previous 5000-1 odds as explained by ESPN’s Paul Carr included 16-year-old Paul Chaplet’s chances at this year’s Masters (where he shot 21 over par and finished dead last) and the Minnesota Timberwolves’ chances to make the playoffs with a month left in the season and their record sitting at 14-35. The odds for Elvis Presley being found alive were also 5000-1. Being written off before the season even started, Leicester really had no chance of failing any expectations given to them, quite frankly because there were no expectations to start with. But that’s when everything clicked. Led by Riyad Mahrez, Danny Drinkwater, Jamie Vardy, and seasoned manager Claudio Ranieri, the Foxes outdid themselves by continuing to be that pesky opponent that just wouldn’t give up even though they seemingly had no business competing with powerhouses like Manchester City, Manchester United, Arsenal, and Chelsea. Yet somehow, with Chelsea holding Tottenham to a draw, Leicester City sat seven points clear on top of the table with just two games to play, making it impossible for anyone to catch them, and crowning them the kings of England. With the third smallest budget in the Premier League, the Foxes became the first team not named Manchester City, Manchester United, Arsenal, or Chelsea in 21 years to win the title, and just the sixth to win out of 48 that have tried since 1992. After a season that proved that money can’t always guarantee a crown, Leicester City concluded the fairy tale of a season that underdogs could previously only dream of. This entry was posted in Soccer and tagged Alex Rodriguez, Arsenal, BPL, Chelsea, chicago blackhawks, chicago bulls, cleveland browns, cleveland cavaliers, england, EPL, ESPN, FIFA, football, Johnny Manziel, lebron james, Leicester City, manchester city, MLB, NBA, NCAA, NFL, Premier League, soccer, Stephen A. Smith, tottenham, Yahoo Sports on May 6, 2016 by Nate Flax. Je’Rod Cherry played safety and on special teams for 4 different teams over the course of his nine-year NFL career. Cherry is best known for his special team work for the Patriots when they won three Super Bowls in 4 years. After his football career Je’Rod Cherry got into broadcast media and in 2009 became a talk show host for WKNR 850 in Cleveland. I had the privilege of meeting Je’Rod Cherry and other former NFL player like Pro-Bowlers Michael Turner and Greg Jones at our annual NFL Journalism Boot Camp. Here is my full interview taken on April 22nd with Je’Rod Cherry. Q: How do you think the media narratives about Tom Brady and Bill Belichick differ from the people they actually are? One thing people don’t know about Bill Belichick is that he’s isn’t just a dark anti-social old guy. Belichick has a great sense of humor and can be a warm, caring person as well. What you see is what you get with Tom Brady. He’s just a great classy guy who everyone respects. Q: You played on some bad teams, and on one of the greatest dynasties of the last 20 years. What were some of the differences between the good teams and the bad teams as far as the locker room atmosphere? Good teams had a common purpose. Good teams won for each other while other teams had too many “me-first” guys. The Patriots instilled a culture that brought people together for the purpose of winning ball games. Q: You said on radio and at the Bootcamp that you feel that if a player truly wants to win they’d play through concussions? Could you expound on this statement? Football is a physical sport. You have to sacrifice your body just to be competent. Sometimes there are situations where you may be hurt. You have to make a decision about whether you value your long-term health or team. The guys that are willing to risk injury and long term health have more determination and warrior spirit needed to play football at the highest level. Q: What do think is the most distinct characteristic of the Cleveland Media? How does it compare to Boston’s media or the national media? The difference between Boston and Cleveland is that the Cleveland media speak there mind more. Cleveland media is more hopeful and can be positive. Q: What was the best advice you’ve received about transitioning from football to the broadcast world? Approach it the same way you would when you play football. If you study hard and work at it you will have a long successful career, just like you would have in football. This entry was posted in General and tagged bill belichick, JeRod Cherry, Tom Brady on May 5, 2016 by footpaul. The 2016 NFL Draft was held this past Thursday night in Chicago and there were some surprises to say the least. A couple of things that may have shocked some fans included linebacker Myles Jack falling out of the first-round, CB Eli Apple being drafted at No. 10 by the New York Giants, and the mind-boggling amount of former Ohio State Buckeyes taken in the first-round. But one thing that took everyone by surprise was how far offensive lineman Laremy Tunsil fell. 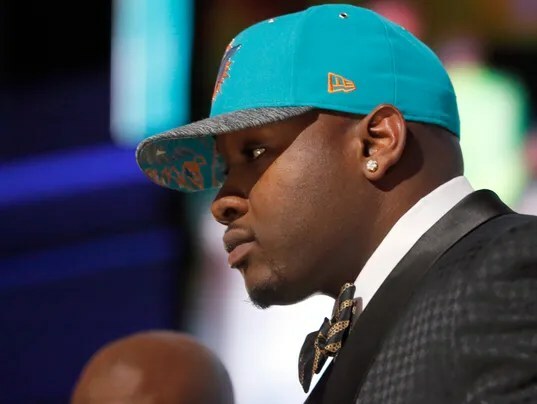 A dramatic series of events led to Tunsil falling all the way to the Miami Dolphins at No. 13. This player, who was once seen as the number one overall prospect in the draft, saw his downfall begin moments before the draft. Exactly thirteen minutes before the start of the draft, a video was posted to Laremy’s verified Twitter account that showed the former Ole Miss Rebel smoking what is assumed to be weed from a gas-mask bong. After a couple of minutes the video was taken down and the account was then deactivated. The video may have only been up for a few minutes but the damage was done and once again the power of social media was demonstrated. Even after Tunsil had been selected by the Dolphins the mayhem continued. After the pick, an image was uploaded to Laremy’s Instagram account that showed text messages supposedly between Ole Miss Assistant Athletic Director John Miller and Tunsil. The conversation consisted of Tunsil seeking money from Miller to pay his mother’s rent and electric bills. Last season at Ole Miss, Laremy served a seven-game suspension stemming from similar accusations where he was found guilty of accepting improper benefits. When it was all over, Laremy was still drafted in the top twenty but his fall cost him millions of dollars. In an article from ESPN titled Video kept Ravens from drafting Laremy Tunsil with No. 6 overall pick, writer Jamison Hensley discusses how the video impacted the Baltimore Ravens evaluation of Tunsil. The author writes, “The Baltimore Ravens would have taken Ole Miss offensive tackle Laremy Tunsil with the No. 6 overall pick were it not for the gas mask video that surfaced.” Even though he only talks about one team, it is probably fair to say the twelve other teams that passed on the prospect were thinking similarly. In the same article, Hensley writes something that ESPN’s Adam Schefter reported, “According to Schefter, Tunsil lost $7 million by falling seven spots in the draft.” Not only did this social media blunder tarnish the player’s image, but it also caused him to lose a lot of money. It was very hard to watch this young man’s life just unravel right in front of us on one of the biggest stages in professional sports. But this is just the latest case of athletes suffering at the hands of social media. Recently it has been reported that the Dolphins believe Tunsil’s former financial adviser is who hacked into these accounts and posted the image and video. During the draft, ESPN analyst Jon Gruden gave his opinion on the issue, “We live in a glass house these days. … There’s a lot of money and people’s futures at stake. I hope this doesn’t come back to haunt Tunsil. Hopefully it’s a learning experience for him. He’s gotta clean this up if he wants to play in this league.” With this statement, Gruden echoes mine and surely many others opinions. Following the draft, Laremy Tunsil admitted to the media that he had in fact taken money from an Ole Miss coach and that the screenshots were real. It is unclear whether the NCAA had already been aware of these actions since they had already suspended the player last season for the same reason. Now that Tunsil had admitted such a thing to an audience of millions, the NCAA will surely continue their investigation with the university. This event is one of the most publicized examples of an athlete being punished for things that had been posted to their social media accounts. Obviously it is unfortunate for Tunsil to fall all the way to No. 13, but he is saying all the right things starting with accepting full responsibility for his actions. The player has a bright future ahead of him in the NFL but this will follow him for many years to come. It cannot be emphasized enough how big of a role social media plays in forming a person’s image and it is crucial for athletes as well as regular people to realize how to properly use these platforms. It is my hope that other athletes learn from this and don’t make the same mistake Tunsil did. This entry was posted in National Football League, NCAA, NFL, TV Shows and tagged Adam Schefter, Baltimore Ravens, eli apple, ESPN, Instagram, Jon Gruden, laremy tunsil, Miami Dolphins, myles jack, NCAA, New York Giants, NFL, nfl draft, Ole Miss, Twitter on May 3, 2016 by fivescoring6.